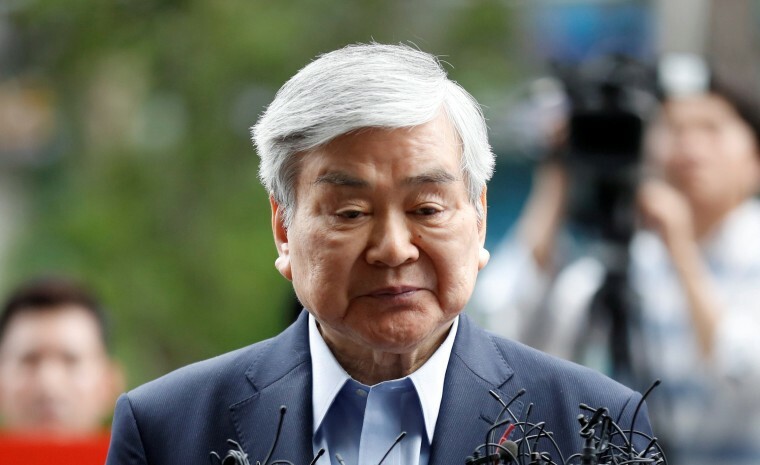 LOS ANGELES — Cho Yang-ho, the chairman and chief executive of Korean Air, whose legal troubles — and colorful daughters — kept him and the airline in an unwanted spotlight, died Sunday, the airline said. Cho, who was under indictment in South Korea on suspicion of embezzlement and of having steered lucrative contracts to companies run by his family, died in a Los Angeles hospital from an illness that the airline didn't identify. But it was scandals involving his daughters that brought worldwide attention to Cho and his family — one involving macadamia nuts and the other involving a water bottle. In December 2014, his daughter Cho Hyun-ah, a company vice president known in the West as Heather Cho, created a viral storm when she threw a tantrum after a flight attendant on a Korean Air flight served her a portion of macadamia nuts in a bag instead of in a dish in first class. Cho Hyun-ah ordered the plane to return to the gate at John F. Kennedy International Airport in New York, causing it to be delayed. She apologized and served five months of a South Korean prison sentence for obstructing aviation safety. Last year, Cho's younger daughter, Cho Hyun-min, also a company vice president, was charged in Seoul, South Korea, with business obstruction and assault after she was accused of having thrown water in the face of an advertising executive during a meeting in England. Cho Hyun-min, who is known in the West as Emily Cho, told police that she threw an empty glass toward a wall, not at the ad executive, because she believed she was being ignored during their conversation. Both sisters resigned from Korean Air last year as their father tried to salvage the airline's reputation. "As chairman of Korean Air, as well as a father, I feel terrible about the immature actions of my daughters," Cho said in a statement at the time. "Everything is my fault and my wrongdoing. I apologize to the people." Korean Air made no mention of the family's difficulties in its statement on Sunday, which called Cho an "air transport pioneer" whose "leadership has been widely recognized over the years." Cho was the initial president of the organizing committee for the 2018 Winter Olympic Games in South Korea, but he resigned the position in 2016 to focus on his company's problems. The games were widely considered to have been a success. In addition to his daughters, he is survived by his wife, Myung-hee Lee; a son, Walter; and five grandsons. Korean Air's stock was up by more than 2 percent in early trading in South Korea on Monday.